Gold 'N Great is back!!! Click on the logo to hear FM108.ca!!! Thanks to Russ Horton and his team for bringing back the station we love!!! To this day it stands unique, as Canada's only '50s and '60s station on FM. From 1978 to 1990 FM 108 battled restrictive government regulations, an erratic signal and strong, well-financed competition to forge out a legendary place in Canadian broadcasting. 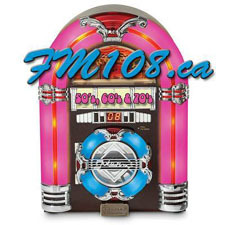 Ask anybody in southern Ontario who loves the oldies about FM 108 and they will invariably tell you they miss the days when radio was Gold 'N Great. "Rock 'n' roll ... it will never die." Visit the FM 108 Facebook page!